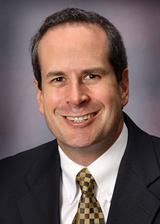 HAYS, Kan. - Dr. Mark Bannister, dean of the College of Business and Entrepreneurship at Fort Hays State University, recently earned his United States Association for Small Business and Entrepreneurship Technology Entrepreneurship Certificate. Bannister presented via conference call on FHSU's efforts to develop an entrepreneurship ecosystem. The presentation impressed judges, who were from Oklahoma State and the University of Missouri-Kansas City. In addition to the presentation, Bannister also participated in a year-long program designed to expand the knowledge of how to teach technology and entrepreneurship. This includes how to help students and alumni launch technology-based businesses. The certificate illustrates the depth and knowledge of the FHSU faculty in the field. The USASBE is the largest independent, professional, academic organization in the world dedicated to advancing the discipline of entrepreneurship. Charlie Wolfe, instructor of management, suggested that FHSU become involved with USASBE to use as a resource for both teaching and scholarly development.